After all of those eyeshadows from the Naked palettes I decide to take a break or at least rest my eyes... And what would be more appropriate than clear skin with just a touch of good eye cream or serum on? A couple of months ago there was a sale in our national drugstore called KOZMO. There I found this little treasure and decided to give it a try. Now, I have been using it non stop for over a month and I love it!!! I borrowed the picture below from their website because when I bought it, I didn't take a photo of it in a box. What can I say? I didn't write my blog then. Now, I know better ;). 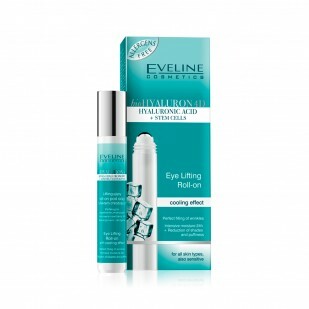 Eveline Eyelifting roll-on is a part of BioHyaluron4D collection. It costs about 5$ and I had a coupon for 30% off which was an amazing deal! Size is 15 ml. Hyaluronic acid is present in all live organisms, including us humans of course (especially in our skin). An average, adult human who weighs 70 kg/140 lbs has approximetely 15 g of hyaluronic acid in his/her body. Hyaluronic acid attracts water and that is the reason it helps hydrating our skin keeping it firm and youthful. The presence of hyaluronic acid decreases as we get older and as a result, we start getting first fine lines and wrinkles. 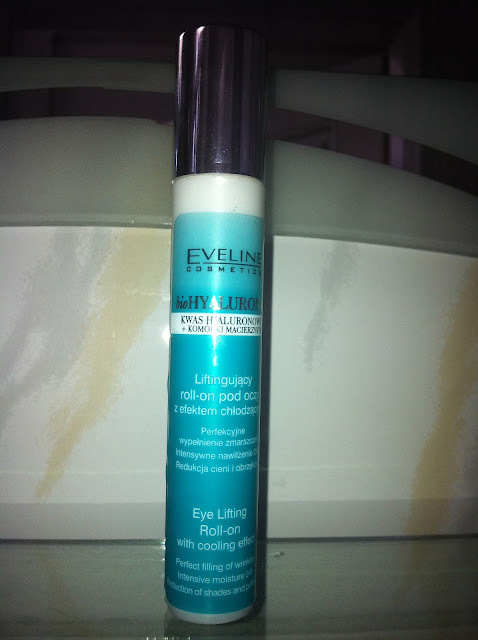 Eveline claims that this product is suitable for all skin types (sensitive skin included). It should offer an intense hydration of the skin up to 24 hours, which helps with dark circles and puffiness. It also fills the lines making them look less visible. All of these effects are possible thanks to the innovative formula with byohyaluronic acid and plant stem cells which stimulate microcirculation. Gel also has a cooling effect and since it is a roll-on with a metal ball it is like a relaxing massage during application which effectively supports puffiness reduction. And as a result your eyes will look youthfull and well rested. INGREDIENTS: byohyaluronic acid, plant stem cells, caffeine, eyebright herb and horse chestnut extract, Matrixyl 3000™, vitamin E, Laminaria Algae, collagen and elastin, silk extract. These claims are made by the company and I, actually, agree with them. Let me just say that I am in no way affiliated with this company and I bought this product with my own money BUT this really is a great product!!! I am a young woman who doesn't have to deal with wrinkles, yet . But, I do notice some fine lines under my eyes. And this really helps with them. I use it in the mornings and before going to bed and it is fantastic for me. If you have dry skin maybe it would be better to combine it with something more nourishing in the evenings. I am saying that because this has a watery consistency and it dries quickly without leaving your eye area greasy. I like that, especially before applying makeup. So, I recommend it not as a primer but as a barrier before puting your primer and eyeshadow on. It really does reduce puffiness and helps with waking up your eyes. I can't really say much about dark circles because I don't have them. But for me this is PERFECT! Will I buy it again? DEFINITELY YES!!! So. What do you say? Do you have it? Would you like to try it? Will you buy it? Cheap,low quality,Polish cosmetic for the masses.